My understanding of cooking is ever-changing. When I was young, it was purely art. Not particularly sophisticated art, but art nonetheless. And it very well should have been at that point in my life. The art was in the bold layering, red and white, red and white, that made my favorite Sunday lasagna supper come to life. It was in the careful placement of rainbow-colored worms (*shudders*) on the cookie-crumbed surface of a trick-or-treater’s delight. It was in the dolloping of perfectly spaced out cookie dough mounds, bursting with jewel-like cranberries and milky white chocolate chunks. As I became increasingly interested in cooking — learning all that I could to make up for the culinary education I was too afraid to go after — the process became firmly entrenched in science for me. Every move in the kitchen, from the angle at which a knife’s blade purposefully hits the cutting board to the sound of a hard sear on a fresh steak, comes down to a fundamental scientific principle. These thoughts took over in the kitchen. As my confidence grew, though, I realized that cooking didn’t need to fall into a single category and that I could reconcile the two principles to ensure that I still produced good food but that I did it in the spirit by which I wanted cooking to be defined in my kitchen — the idea that cooking, for me, was a therapeutic release, a pleasure and a means to bringing smiles to loved ones’ faces. So while I now firmly see cooking as both science and art — in fact, I have come to see that art is intrinsic in most science — I realize, it’s the art alone that brings us through the gray days. It’s the science that I ponder when alone, but the art that I hope to share through blogging. And it’s the art that motivates me to keep cooking, even on the longest of days. Of course, art is in the doing, but it’s also in the color of dishes like this simple hash that puts a smile on my face and brightens the most ordinary of winter days. I am guilty of matching my winter dinner palate to the monochrome dullness of the view outside my window. It’s easy to forget just how vibrant and healthful winter vegetables are. I have been adding roots to my dishes whenever I need some cheering up, and this comforting, “anytime” meal is often just what I need. 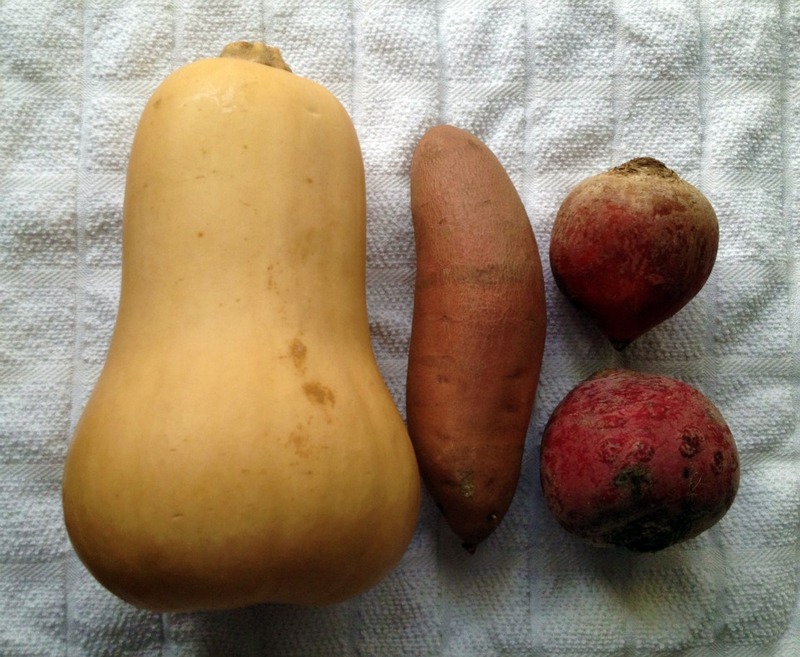 When I saw these beautiful red, golden and candy stripe beets, placed suggestively next to the butternut squash and sweet potatoes at Russo’s, I knew they were meant to come together on my plate. A hash is the classic I-want-to-use-up-all-of-these-spare-ingredients-so-I-guess-I’ll-just-top-them-with-an-egg dish. Here, roasted and caramelized root veggies are tossed with bacon fat-browned shallots. 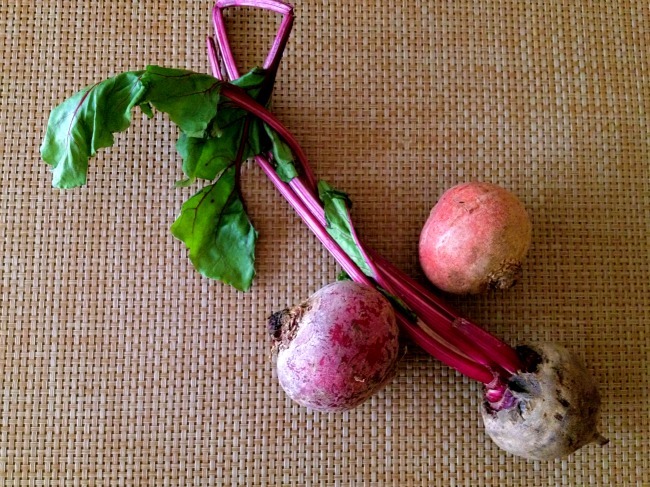 The beets offer a pop of jewel-toned color here and there, but the true beauty of this dish is in the combined hues. The flow of the sunny yolk of a perfectly poached egg blankets the sweet and deeply caramelized vegetables, while a hint of bitey mustard and vinegar cut through its compelling richness. The simple dish will surely grace my plate till the first stems of asparagus hit the farmers’ market. Instead of using the classic approach and parcooking the veggies and browning them in the pan, I found it much easier to roast them to candy-sweet perfection before tossing them in the pan to ensure even cooking. And yes, I do sometimes have bacon fat to use for sautéing in my fridge. Those who don’t hoard animal fats can fry up some bacon first to sauté the shallots. If you like, crumble some up and toss with the veggies and vinegar mix before plating. You can, of course, use oil instead. Also, I like the base for my eggs to have some acid so it pops beneath the rich yolk, but the hash will still be plenty flavorful without the vinegar-mustard mix. Wrap beets in aluminum foil and place on a baking sheet. Roast for 1 to 1 ½ hours (depending on the size of you beets), until tender and you can easily slide a pairing knife through to the middle of the beets. When cool enough to handle, peel beets and cut into ½ inch dice. Meanwhile, toss squash and sweet potatoes with olive oil, ½ tsp of salt and ¼ tsp of pepper and spread out on a baking sheet. Roast for 25 to 35 minutes, flipping and tossing halfway through cooking, until browned and just tender. In a medium bowl, combine vinegar and whole grain mustard if using. Heat bacon fat in a large skillet, preferably cast iron, over medium heat. When hot, add shallots and ¼ tsp of salt and stir constantly until softened and lightly browned, 4 to 6 minutes. Add squash, potatoes, beets and thyme to the shallots and stir occasionally for five minutes to rewarm the vegetables and to let the flavors meld. 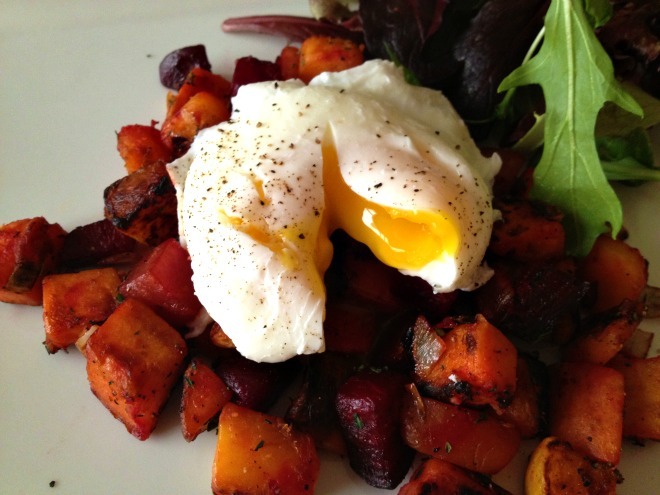 While the hash is cooking, poach your eggs, using whatever method works for you. Empty the contents of the skillet into the bowl with the vinegar mix and toss. Top with poached egg. Sprinkle egg with salt and pepper if desired and serve immediately. Ha, ditto to the above comment. Looks gorgeous and sounds delish. Beautiful! Except I’m terrified of poached eggs [I have food texture issues, ha]. But it looks amazing! What a fantastic post! The story is great, the photos are gorgeous, and the recipe sounds delicious. I’ll have to give this a try really soon! This looks beautiful! 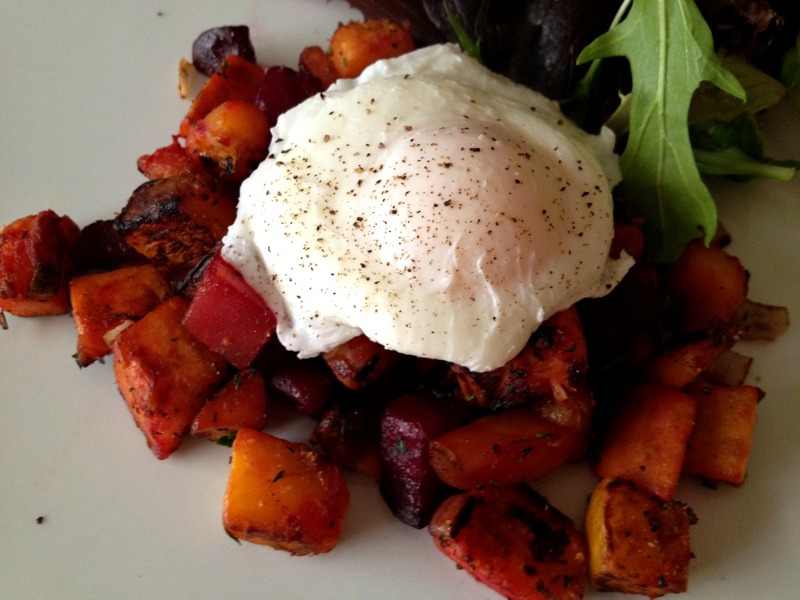 i have been so into roasting all sorts of veggies lately, and I LOVE poached eggs. I should definitely give this a try soon! Can’t beat a dish that is healthy and delicious to boot! that egg is PERFECTly poached. you have a brilliant way with words, i loved reading this. oh and i love making hash for breakfast with leftovers!! 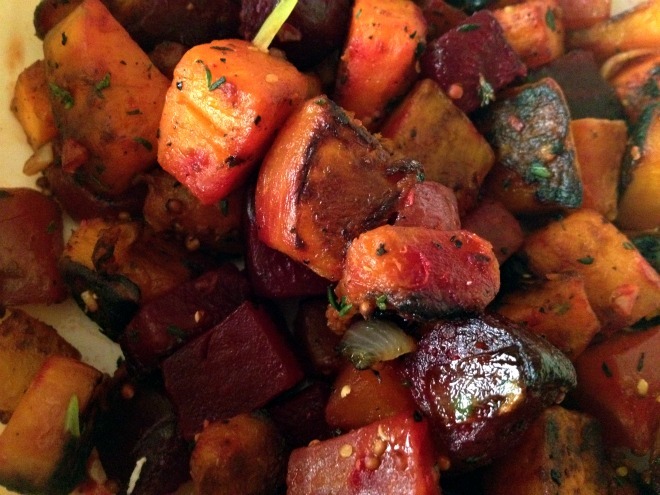 I love roasted root vegetables and love even more that you hoard bacon fat! Wow — I love the caramelization on these root veggies! And that egg is INCREDIBLE. Thanks for stopping by my blog – so glad to know about yours!